The economics of renewables makes them a strong contestant for utilities. But the rise of another fuel source will help cement renewables into our nation’s power grid. Standing on my toes, I spotted the voice of skepticism coming from a young lady in the back of my class. It was 2015, and I was going through my lecture on energy(NYSEARCA:XLE). I projected a pie chart of energy sources on the board. Solar (NYSEARCA:TAN)energy occupied a tiny sliver — just 1%. Renewable energy, especially solar, has struggled to gain traction. But there is reason to believe that this marginal role is going to change very soon. Electricity is the defining trait of modern life. Every gadget in our lives relies on instant power in the form of electricity. Electric generators, or utilities, are the source for all life’s modern comforts. Coal, solar, nuclear, wind, natural gas and hydropower all contribute to the grid. 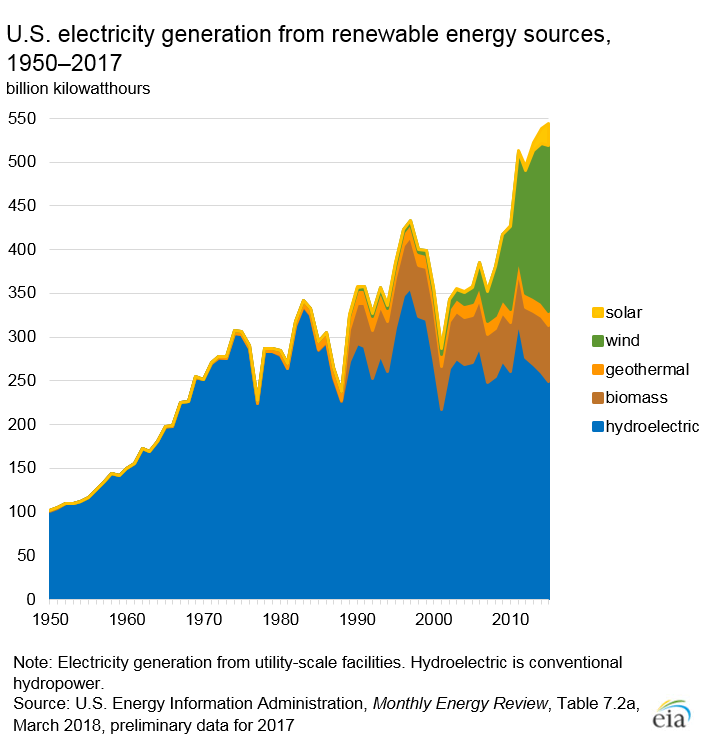 Hydropower was the largest source of renewable energy, but it’s gone stagnant. There are no new major rivers popping up to house more dams. This makes room for wind (NYSEARCA:FAN) and solar sources to grow. They’re the face of the future of energy, but uptake is slow. Wind energy now supplies 6.3% of the total electricity. Solar lags behind and only offers 1.3%. Below is a chart of the electric generation by energy source. The reason for this slow uptake isn’t because of any conspiracy from “Big Oil.” It all comes down to economics. In the cutthroat world of energy producers, there is little room for inefficiencies. Modern solar panel technology has been around since the 1950s, but it’s struggled to reach mass adoption. Even with tax credits and incentives, solar was a costly option. A megawatt-hour (MWh) of solar power sold for about $145 in 2010. At $60 per MWh, wind was cheaper that same year. But both sources held a premium to natural gas(NYSEARCA:UNG) and coal, which were around $35 MWh. But the tides are turning for renewables. The cost of solar power is now around $40 MWh, and wind is about $20 MWh. Advancements in tech will see the price of wind and solar fall another 20% to 30% over the next two years. Hydraulic fracturing led the renaissance in American energy production. Shale basins, like the Permian in Texas, helped to catapult America back on the world energy stage. In 2018, we became the leading energy producer. The Energy Information Administration estimates that we will be a net exporter of energy by 2022. It’s not just oil that’s coming out of these wells. Shale basins are rich in natural gas. A growing network of pipes is helping transport this cheap energy source to utilities. Natural gas is the perfect partner for renewables. While coal and nuclear power plants can take the better part of the day to reach operating efficiency, natural gas turbines can spool up in a matter of minutes. That means natural gas can step in to deliver consistent power when the wind stops blowing or the sun goes into hiding. There is one company that is capitalizing on renewables better than any other. The March edition of Real Wealth Strategist will take a deep dive into why this company will continue to lead the way in profitable clean energy.